New Upper West Side restaurant Domain NYC serves American fare with a global influence. Chef Derrick Styczek's menu includes dishes like shellfish carbonara, jumbo shrimp in a foie gras sauce, and scallops in a Peking duck broth. Domain NYC, 2869 Broadway, New York, NY 10025, 212-678-8585. Named after Grace O'Malley, a sixteenth-century pirate, Irish pub Grace will offer a cocktail list created by an all-female team of mixologists. A seafood-heavy menu will be available, too. Grace, 365 Third Ave., New York, NY 10016, 646-918-6553. Ed Schoenfeld, owner of RedFarm, has opened a pop-up, Red Farm Steak, in the subterranean space below his West Village restaurant. The 28-day restaurant will serve Asian starters, seafood and, of course, steak. Red Farm Steak, 529 1/2 Hudson St., New York, NY 10014, 212-792-9700. Down the street from his popular Thai eatery Pok Pok NY, Andy Ricker has opened Whiskey Soda Lounge NY, a bar/lounge that serves up traditional and adventurous Thai food as well. Whiskey Soda Lounge NY, 115 Columbia St., Brooklyn, NY 11201, 718-797-4120. Mayhem & Stout, once a staple at food markets around the city, now has a fixed location. The eatery serves up meaty sandwiches with creative toppings like blueberry sriracha sauce. Mayhem & Stout, 711 Second Ave., New York, NY 10016, 212-986-1600. Newcomer Barley & Grain, located on the Upper West Side, serves classic American dishes and steaks. The drinks menu boasts 100 American, Irish and Scottish whiskies and 12 rotating American craft beers. Barley & Grain, 421 Amsterdam Ave., New York, NY 10024, 646-360-3231. Casa Pomona, located on the Upper West Side, serves up Spanish tapas. This is actually take two for the place, which was open for six weeks in 2012 before a flooding problem in the building shut the restaurant down. The chef is Don Flores, who has worked with Morimoto, David Chang and Bobby Flay. Casa Pomona, 507 Columbus Ave., New York, NY 10024, 212-362-3200. Chef Michel Richard will soon open Pomme Palais, featuring both sweet and savory items, including pastries, sandwiches and breakfast offerings. Pomme Palais, 30 E. 51st St., New York, NY 10022, 212-891-8100. Daisuke Nakazawa has arrived. The sushi chef, who many might remember from the documentary "Jiro Dreams of Sushi," has set up shop in his own restaurant in the West Village. Sushi Nakazawa comprises a ten-seat sushi bar and dining room. Sushi Nakazawa, 23 Commerce St., New York, NY 10014, 212-924-2212. Debuting on the 18th floor of a Midtown building is the Monarch Rooftop Lounge. The 5,000-square-foot rooftop lounge offers signature cocktails and nibbles. Desserts are by Bindi chocolates. Monarch Rooftop Lounge, 960 Sixth Ave., New York, NY 10001, 212-630-9993. Part of a nationwide chain and the first in New York City, Paradise Biryani Pointe has opened in the section of Murray Hill known as "Curry Hill." The restaurant's specialty is, you guessed it, biryani, a meaty dish that is a specialty in Hyderabad. Paradise Biryani Pointe, 77 Lexington Ave., New York, NY 10010, 212-686-2299. Il Gattopardo is moving just down the street from its current location and will open there on Labor Day, September 2. The restaurant is now in the space once occupied by Aquavit. Il Gattopardo, 13-15 W. 54th St., New York, NY 10019, 212-246-0412. Prince, in town to do a show at City Winery, recently dined at Michael White's SoHo steakhouse Costata. When it came time to pay the bill, the self-proclaimed "Purple Yoda" realized he had no money on him. The staff let Prince and his entourage walk. The bill was later settled. Prince gave a $500 tip. Costata, 206 Spring St., New York, NY 10012, 212-334-3320. After 22 years, Bobby Flay's Mesa Grill is shutting down. The prolific chef blames it on New York real estate. The restaurant will serve its last coffee-rubbed chicken at the end of August. Mesa Grill, 102 Fifth Ave., New York, NY 10011, 212-807-7400. The Maccioni Restaurant Group (Le Cirque, Circo, Sirio Ristorante, etc.) will open their first restaurant in the Middle East. Circo Abu Dhabi is scheduled to make its debut at the InterContinental Abu Dhabi in early 2014. Like the New York original, this branch of Circo will serve upscale Tuscan fare. Circo, 120 W. 55th St., New York, NY 10019, 212-265-3636. 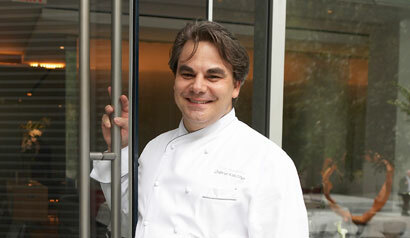 Michael D. Mignano has been named the executive pastry chef at The Pierre, A Taj Hotel, New York. Mignano previously worked at Main Street Bakery & Cafe on Long Island. The Pierre, A Taj Hotel, New York, 2 E. 61st St., New York, NY 10021, 212-838-8000. Franck Deletrain is the new executive chef at Brasserie 8 1/2. The chef previously logged time in the kitchens of Patroon, The Sea Grill, and The Four Seasons Restaurant. Brasserie 8 1/2, 9 W. 57th St., New York, NY 10019, 212-829-0812. Shaun Hergatt made a name for himself at his eponymous downtown restaurant, SHO Shaun Hergatt. But last year he left the restaurant. Chef Hergatt is resurfacing as the top toque at Juni, a new spot in the Hotel Chandler. Expect preciousness on the plate. Juni, Hotel Chandler, 12 E. 31st St., New York, NY 10016, 212-995-8599. Union Square Hospitality Group has just announced that chef Gabriel Kreuther, top toque at The Modern in New York, will be leaving the restaurant for good at an unspecified time later this year. The chef plans to open his own restaurant in 2014. The Modern, The Museum of Modern Art MoMA, 9 W. 53rd St., New York, NY 10019, 212-333-1220. Dan Silverman, who had been the chef at The Standard Grill, is now the top toque at a yet-to-be-announced new restaurant inside the Loews Regency Hotel. Loews Regency Hotel, 540 Park Ave., New York, NY 10021, 212-759-4100, 800-23-LOEWS. Plein Sud, the French eatery in the Smyth TriBeCa hotel, has shut down. A new restaurant will take its place sometime later this year. Plein Sud, Smyth TriBeCa, 85 W. Broadway, New York, NY 10007, 212-204-5555. Upper West Side Chinese restaurant China Fun has closed. China Fun, 246 Columbus Ave., New York, NY 10023, no phone. JoeDoe, an East Village favorite, has shut down. It will reopen in the fall as Joe & MissesDoe. JoeDoe, 45 E. 1st St., New York, NY 10003, no phone. Tribeca Canvas, which is associated with chef Masaharu Morimoto, is closing. The restaurant will reopen with the name Canvas in the fall. Tribeca Canvas, 313 Church St., New York, NY 10013, 917-720-2845. Peruvian chef Gaston Acurio's La Mar Cebicheria Peruana has shut down. La Mar Cebicheria Peruana, 11 Madison Ave., New York, NY 10010, no phone. Pho 32, a Vietnamese restaurant in the East Village, has shut down. Pho 32, 13 St. Marks Pl., New York, NY 10003, no phone.